Please refer to our stock # 2077 when inquiring. 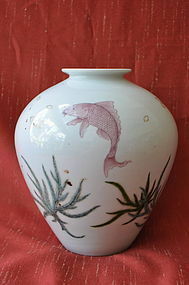 Elegant porcelain vase painted with goldfish among seaweed in pale pink, green and gold; the vase with wide body and incised mark of Seifu (Seifu Yohei III 1851-1914) on base. Early 20th century. Provenance: Acquired prior to 1949 in Asia. Inquire about detailed provenance.